Wawona was an American three-masted, fore-and-aft schooner that sailed from 1897 to 1947 as a lumber carrier and fishing vessel based in Puget Sound. She was one of the last survivors of the sailing schooners in the West Coast lumber trade to San Francisco from Washington, Oregon, and Northern California. Wawona was built near Eureka, California on Humboldt Bay by Hans Ditlev Bendixsen, who was one of the most important West Coast shipbuilders of the late 19th century. The vessel was 165 feet (50 m) long with a 35-foot (11 m) beam. Her masts were 110 feet (34 m) tall. She was berthed at South Lake Union Park in Seattle adjacent to the Center for Wooden Boats. She was listed on the National Register of Historic Places, the Washington State Heritage Register, and was an official city landmark. However, after efforts to restore the decaying ship failed, she was dismantled in March 2009. In 2012 artist John Grade used parts from the ship in a massive 65-foot sculpture called Wawona in the Grand Atrium of Seattle's Museum of History & Industry. Wood from the ship was also used to create the museum's front desk and the bar at the museum's Compass Cafe. From 1897 to 1913, the schooner carried lumber from Grays Harbor and Puget Sound ports to California. One of her captains, Ralph E. "Matt" Peasley, inspired a series of popular novels. From 1914 until 1947, except during World War II, Wawona sailed to the Bering Sea with a crew of 36 to fish for cod. In 1935, her captain, Charles Foss, died at the wheel during a storm in the Aleutian Islands. In 1964, sixteen years after the vessel's retirement, a group of Seattle citizens, headed by Kay Bullitt, formed Northwest Seaport and purchased Wawona as a museum ship. The schooner was made available for public visits during her ongoing restoration. In 2006 her masts were removed for safety reasons. 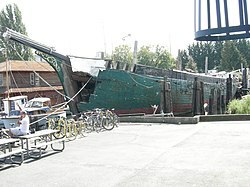 In early 2009, it was announced that Wawona would be towed to a dry dock to be dismantled on March 2. Some of the vessel's features were preserved as museum pieces. 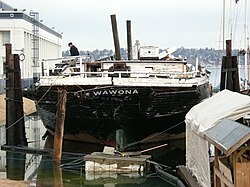 Wawona was hauled to the Lake Union Drydock on 4 March 2009 and was dismantled. The only remaining West Coast lumber transport sailing ship is C.A. Thayer, which is in San Francisco, as of 2018 completing a multimillion-dollar, multi-year restoration by the National Park Service. ^ "Landmarks and Designation". City of Seattle. Retrieved 2013-03-05. ^ "Landmarks Alphabetical Listing for S". City of Seattle. Retrieved 2007-12-28. ^ "Last voyage near for Wawona". The Seattle Times. 25 February 2009. Retrieved 2009-02-25. ^ "Fate of the Lumber Schooner Wawona". Puget Sound Magazine. Retrieved 2012-08-09. Wikimedia Commons has media related to Wawona (ship, 1897). Jones, Gordon P. (July 1969). "National Register of Historic Places Inventory – Nomination Form". National Park Service. Retrieved 2013-03-06. "Accompanying Photos". National Park Service. Retrieved 2013-03-06. This page was last edited on 7 November 2018, at 23:30 (UTC).